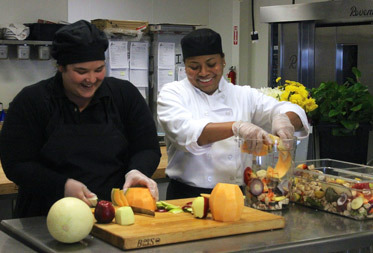 Utah Food Services is a full service caterer committed to serving the local community and preserving the environment. Thinking globally, UFS promotes mindful and creative ways to reduce our carbon footprint. UFS teamed up with Momentum Recycling to implement an aggressive recycling program including monthly collection logs quantifying the volumes of glass, green waste, mixed recyclables, fry oil, cardboard and paper diverted from the land fill. On average the amount of waste diverted from our local landfill is 160,000 pounds annually. Our management staff uses this data to continually train our staff to improve our diversion rate. 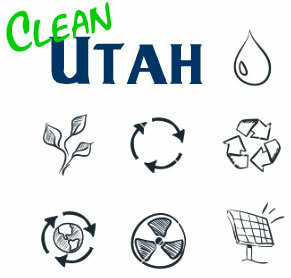 In fact, the Department of Environmental Quality (DEQ) recognized our sustainable practices and certified UFS as a “Clean Utah” company. While diverting waste is a priority, finding a home for unused product is a necessity. Our chefs work with the Utah Food Bank and local shelters to expedite delivery of excess food while always maintaining safe food handling practices. We continually strive to be even more eco-friendly. Other green efforts include buying organic, seasonal and locally grown food products whenever possible. UFS contracts with Blue Spring Farm for weekly deliveries during the growing season. Additionally, our disposable service ware is 100% biodegradable greenware (hot/cold cups, plates, napkins, and cutlery). Our sales staff recommends water coolers to our clients rather than plastic water bottles. As a model kitchen for the Salt Lake Health Department, UFS exceeds standard practice while incorporating 100% biodegradable non-caustic citrus based cleaners. Most recently, UFS converted their fleet of vehicles to propane which yields 87% less smog-producing hydrocarbons compared to gasoline. UFS diverts 160,000 lbs of waste from our local landfills on an annual basis. Our disposable service ware is 100% biodegradable plant-based products. Conversion to propane fueled vehicles reduces smog producing hydrocarbons. In addition to supporting numerous charities, local shelters benefit from surplus food inventory delivered in reusable containers. Dish machines with low level ware arms reduces water usage by 30%. UFS contracts with a local farmer to buy organic produce during the growing season. UFS developed an internal system to compost all fruit, vegetable and floral waste diverting 24,000 lbs annually. Our team uses 100% biodegradable non-caustic citrus based all-purpose cleaners. Education: Onsite training seminars motivate our employees to continually evolve our eco efforts. ECO-FRIENDLY EFFORTS INCLUDE ON-SITE TRAINING, SUPPORT, AND RESOURCES TO MAKE THE ULTIMATE GOAL OBTAINABLE, NO MATTER IF IT'S A SUCCESSFUL CATERING CONVENTION OR A NEW RECYCLING PROGRAM.